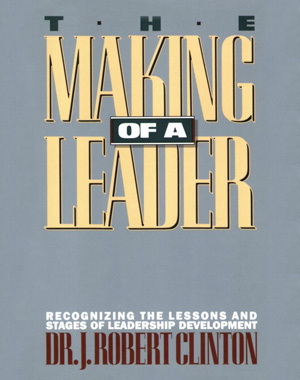 This is the best-selling book from Bobby Clinton that introduces the paradigm of Leadership Development. Available at sites listed below or through Christian bookstores. Gives perspective on how a leader develops over a lifetime. Organized around a six stage time-line, Clinton defines processes that God frequently uses to shape a leader for a lifetime of ministry. (272 p.) Over 110,000 copies of this have been sold. Translated into 7 languages.